This week, my guest on the Progressive Radio Network is food writer and author, Casey Barber, to talk about her food journey and path to writing Classic Snacks Made from Scratch. In this book, Casey shares 70 recipes, on how make some of your favorite childhood memory “Brand-Name” treats. using real food! What a concept! Please join me on Thursday, as we explore some of these recipes, and the inspiration behind them. Sauté onion in olive oil or butter. When translucent, add celery. After 5 minutes, add garlic and chopped mushroom stems. Add walnuts, parsley and 2 Tbs. red wine. Add remaining ingredients. Adjust spices to taste. My guest this week on the Progressive Radio Network is Gia Giasullo, a co-owner of the Brooklyn Farmacy & Soda Fountain. I stumbled upon this place while exploring Brooklyn, and instantly fell in love! It wasn’t so much about the soda fountain offerings that attracted me, it was the memories it sparked from my childhood, and it seems I am not alone! When Brooklyn Farmacy & Soda Fountain opened their doors in 2010, they launched a revival of the Soda Fountain Shoppe to a new generation of foodies, complete with local, seasonal and artisanal ingredients. Please join me on Thursday, as I talk with Gia about The Brooklyn Farmacy and her new book, the Soda Fountain. Meanwhile, toss eggplant cubes with olive oil and bake at 425* for 15 minutes, until soft. Cover bottom of cast iron pan with olive oil. When oil is hot, add the tofu. Allow the tofu to develop a golden skin by shaking the wok to prevent sticking, but not stirring until the tofu is golden on one side. Turn tofu over and add the garlic and onions. Continue cooking at med. high heat, stirring constantly for 5 minutes. Add a few splashes of tamari to taste and a little water, and reduce the heat to low. Cover and let simmer for 5 minutes. 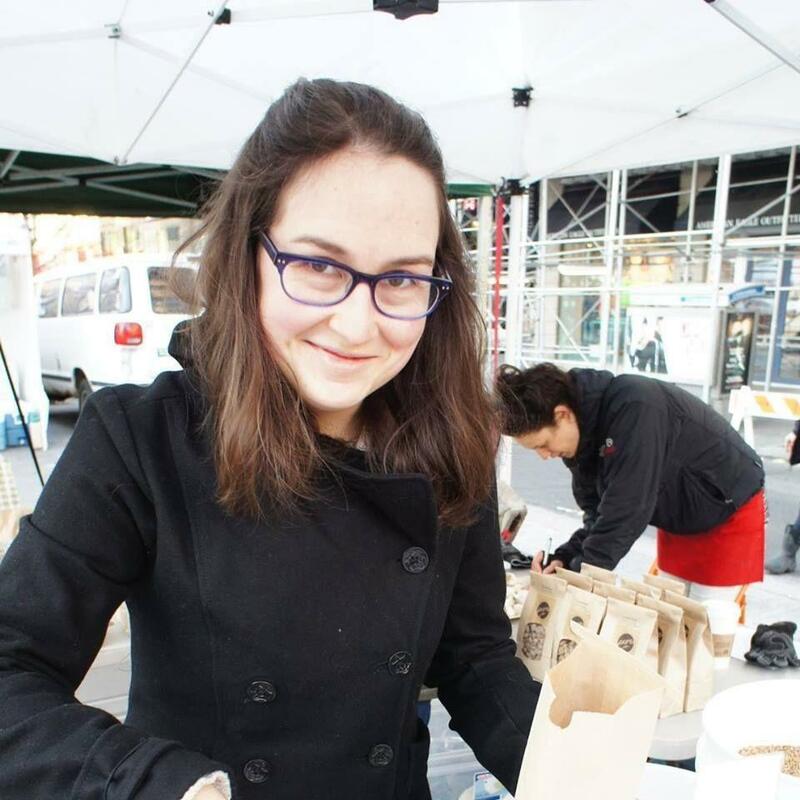 I will be interviewing Kate Galassi, one of the Co-Founders of Quinciple, an on-line farmers market service, bringing boxes of fresh produce to New Yorker’s doors. Kate spent three years foraging for New York City restaurants, and built wonderful relationships with the local farmers growing the food she now delivers. Please join me on Thursday, to learn more about Quinciple, and the work Kate is doing in the city for the local food movement. while the food processor is on, add the olive oil and blend. This week, my guest is Bob Brinkmann, Professor and Director of the Sustainability Studies Dept. at Hofstra University, and the Director ofSustainability Research at the National Center for Suburban Studies. I invited Dr. Brinkmann on my show to share with us some of the innovative ways that college campuses are engaging students to take up Sustainability as a major, and the type of real life challenges that the students’ research projects are aiming to solve. I have also had the opportunity to work with Dr. Brinkmann as the liaison between Hofstra University (host of the upcoming 2015 Long Island Food Conference and the 2012 LI Small Farm Summit) and the organizers of the Conference. Bring a large pot of water to boil. Add the peaches and let boil for 3 minutes, then remove from water and transfer to ice bath. This will make peeling the peaches easier. Then slice them and put in separate bowl. In electric mixer, cream sugar and butter, until fluffy. Add eggs, one at a time, and beat. Add in vanilla. In separate bowl, combine flour, baking soda and salt. Add dry mix to butter mixture and beat well. Spoon batter into 10 or 12” tart pan. Place peaches skin-side up on top of batter. Sprinkle lightly with sugar and lemon juice depending on sweetness of fruit. Sprinkle with 1 teaspoon of cinnamon. Bake for one hour. Remove and cool to lukewarm and serve with whipped cream or ice cream. Refrigerate or Freeze if desired.